Spirited, intelligent Morayo grows up surrounded by school friends and a busy family in modern-day Ibadan, Nigeria. An adoring little sister, her traditional parents, and a host of aunties and cousins make Morayo’s home their own. So there’s nothing unusual about Morayo’s charming but troubled cousin, Bros T, moving in with the family. At first Morayo and her sister are delighted, but in her innocence, nothing prepares Morayo for the shameful secret Bros T forces upon her. Thrust into a web of oppressive silence woven by the adults around her, Morayo must learn to fiercely protect herself and her sister; a legacy of silence many women in Morayo's family share. 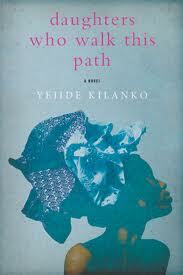 Only Aunty Morenike-once protected by her own mother-provides Morayo with a safe home, and a sense of female community which sustains Morayo as she grow into a young woman in bustling, politically charged, often violent Nigeria. It was released in April and published by Penguin Canada, so no idea if it's available outside of North America right now, but looks like a pretty interesting debut. Hello, you did mention that you are always looking out for new authors and books; I wanted to let you know that you can follow this blog to get updates in your email about new books by Nigerians. Wow! I just checked it out - it's great! I really do love searching for new authors/books so thanks for letting me know about this.